* * Receive 10% off your order when you spend £25 in April! * * Sign up to my mailing list for my latest news and special offers! 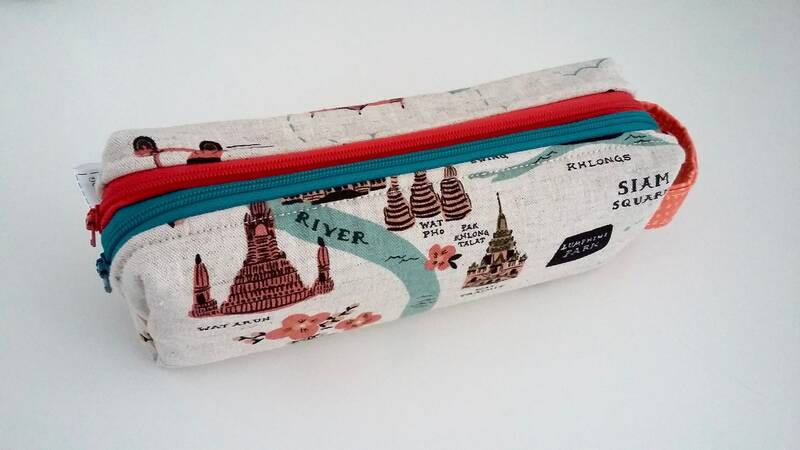 A small sized, double zipped boxy pencil case in this rare "City Maps" canvas Rifle Paper Co print featuring the city and sights of Bangkok on a beige background. The pencil case is padded all round giving it a boxy shape, with a soft and squishy feel. 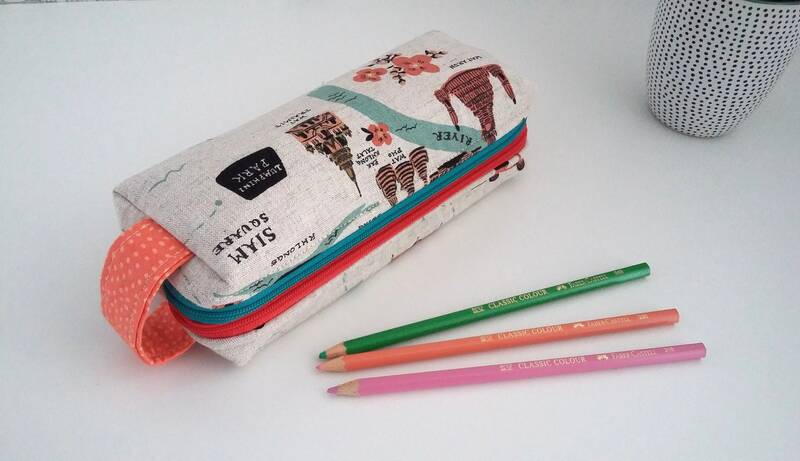 There are two different colour zips with separate compartments in different colour linings to store items like pens, pencils, cosmetics, sewing notions, small hair accessories, etc. Please note, zip and lining colours may differ from those shown. As this is a made-to-order item, please expect 1-2 weeks delivery by 2nd class post with proof of postage or standard international shipping. 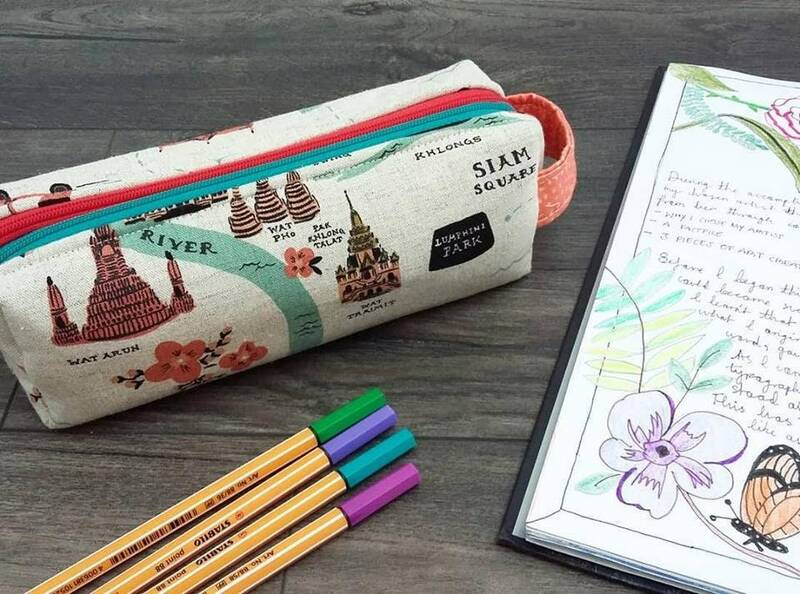 In order to fulfil your order, I need certain information from you (which you authorised Etsy to provide to me), such as your name, email address, postal address, payment information, and the details of the product that you’re ordering. You may also need to provide me with additional personal information (such as family names for my personalised advent calendars) which you can include in the checkout notes or if you contact me directly. Why and how do I use your information? •	Trusted third party service providers such as Royal Mail or Parcelforce to deliver your order. I will share your personal information with these third parties, but only to the extent necessary to perform these services. I may collect, use, retain, and share your information if I deem it is necessary to: (a) respond to a legal process or to government requests; (b) enforce my agreements, terms and policies; (c) prevent, investigate, and address fraud and other illegal activity, security, or technical issues; or (d) protect the rights, property, and safety of my customers, or others. •	Access. You have the right to access and receive a copy of the personal information I hold about you by contacting me using the contact information below. •	Change, restrict, delete. You may also have rights to change, restrict my use of, or delete your personal information. Apart from exceptional circumstances (like where I am required to store data for legal reasons) I can delete your personal information upon request. •	Complain. If you reside in the EU and wish to raise a concern about my use of your information, you have the right to do so with your local data protection authority. Personalised and customised items are non refundable. For custom items where fabrics have been obtained especially for your order, a pattern has been upscaled or downscaled to a custom size, a pattern has been modified or a bag has been created to your personal specification or personalised with a name cannot be returned for a refund as these are one of a kind products made just for you! Please ensure that you are completely happy with a custom bag description before you make payment. My bags are handcrafted with the greatest care using high quality materials, interfacings and metal hardware. Never overload your bag with heavy items as this will cause wear and tear, spoil the shape of the bag and put a strain on the strap. Do not immerse my bags in water, or a washing machine! The layers of special interlining, interfacing and lining could displace or shrink in the wash and any metal hardware will become damaged. For fabric bags only: spot clean with a mild soap solution. Touch up any creases with an iron on a low setting. For bags with faux leather or laminated (wipe clean) fabric:Spot clean with a mild soap solution. Wipe clean gently with a soft damp cloth. Do not iron! Do you offer other wipe clean fabrics? Do you offer other cotton fabrics? I wrap my products in brown paper, tissue paper or bubble wrap depending on the item and use strong polythene mailing bags to ensure the parcel is waterproof. Larger bags will be packaged in a sturdy box. If you wish to send an item directly to someone as a gift, let me know and I will wrap it in pretty tissue paper and be sure not to include an invoice or price details with their parcel. Sew Sofia is not responsible for customs duty or brokerage fees on international orders. These will have to be paid by the customer where applicable. If an item is returned to me by the Royal Mail as unclaimed I will contact you to arrange for the item to be redelivered as soon as possible. Please respect that if such a situation occurs there will be an extra charge for postage to cover the cost of resending the item for you. 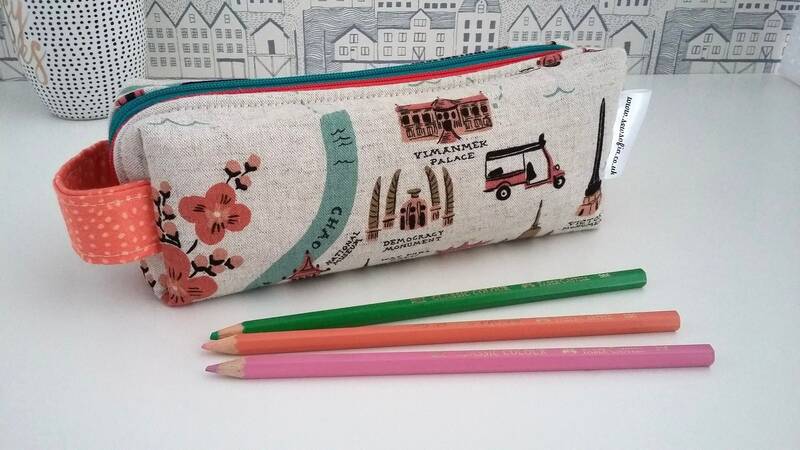 Sew Sofia cannot be held responsible for items lost once they have been handed to the Royal Mail for delivery both in the UK and when being posted to overseas locations. I will always obtain a certificate of postage to trace delivery of goods.